"... Millennials have surpassed Baby Boomers as the nation’s largest living generation, according to population estimates released this month by the U.S. Census Bureau. 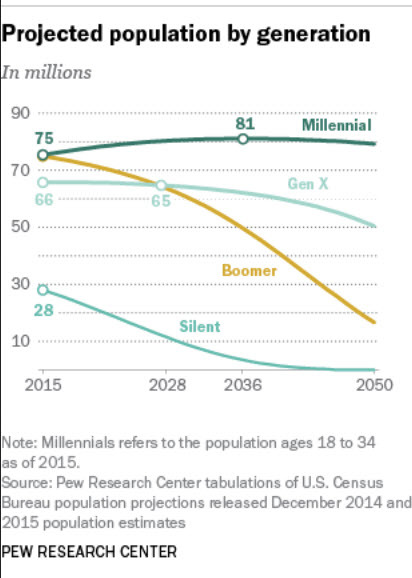 Millennials, whom we define as those ages 18-34 in 2015, now number 75.4 million, surpassing the 74.9 million Baby Boomers (ages 51-69). 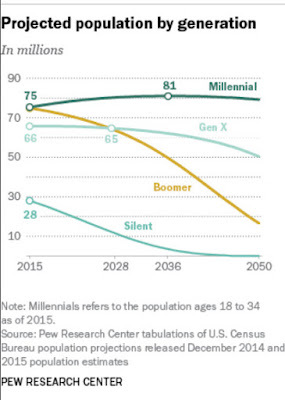 And Generation X (ages 35-50 in 2015) is projected to pass the Boomers in population by 2028..."